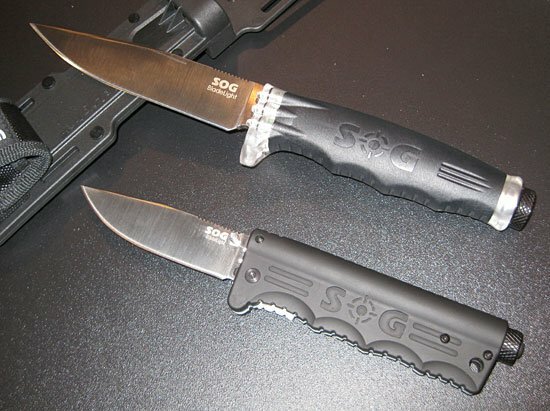 At the SHOT Show, I got to view some 2012 products by SOG Specialty Knives. One of the most unique was the brand new series of Blade Light knives that will be released later this year. Typically, a knife with a built-in flashlight is usually a flashlight with a built-in knife. A good example of this is the Tool Logic SL1 folding knife. It has a flashlight that can be used in conjunction with the blade, but also removed for other tasks. This is not the aim with the SOG Blade Lights. SOG Marketing Manager Chris Cashbaugh walked us through the set-up. 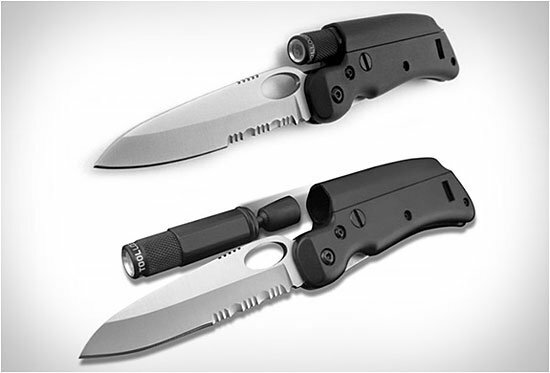 The Blade Light knives are a fixed blade and folder that have LED lights housed in the handles. The lights are dedicated to providing illumination for the blade for cutting in low or no light conditions. For this, they do an outstanding job. 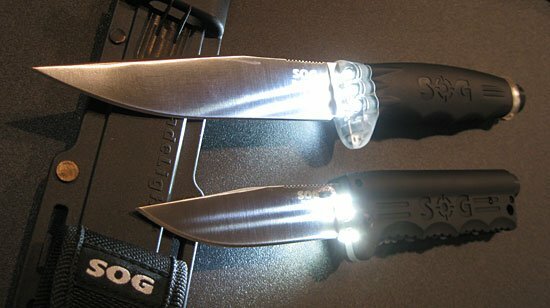 SOG’s patent pending design places three white LED’s on either side of the blade at the handle junction. With the lights turned on, there is light on either side of the blade edge, so the material being cut is evenly lit. No shadows or shaky ghosting. It also allows for a free hand to assist the work. The fixed blade knife has a 5.7” clip point blade of 9Cr18MoV steel. That’s 9% carbon and 18% chrome, which makes it a close cousin of 440c stainless steel, known for good durability and edge retention. Glass reinforced nylon (GRN) comprises the grip portion of the handle and contains the single AA battery that powers the light. The light’s switch is on the knife’s tailcap, like many standard flashlights. Light output is 25 lumens for a run time of 175 minutes. The fixed blade comes with a MOLLE compatible sheath, one cool feature of which is that it allows for the light to be used with the knife at home in the sheath. Because of the blade, it does not make it like a full utility light, but it does allow for some limited illumination. SOG’s Blade Light folding knife contains a 3.9” clip point blade of 9Cr18MoV steel. It has dual thumb studs and locks open with a Walker liner lock. The GRN handle carries the two AA batteries for the light. Like the fixed blade, the Blade Light folder has a tailcap activation, which has momentary and constant on function. Unlike the fixed blade, the 34-37 lumens of light from the folder’s LEDs can be used with the blade closed. This makes it much more like a traditional flashlight when folded. The light can be used safely with the blade folded or used to shine on the cutting area with the blade exposed. Run time for the folder’s light is 260 minutes. Both Blade Lights have an IPX-7 rating for full water immersion at 1 meter for 30 minutes. MSRP for the Blade Lights will be $115.00 for the fixed blade and $85.00 for the folder. These prices will be much reduced with a little shopping effort. Okay, when I first saw the Blade Light, I thought it was kinda gimmicky. But after turning them on and playing with them, I can definitely see where they can be very useful. Cashbaugh said a drop point blade is in the works. I think that would be a great tool for hunters who end up with game to field dress at dusk or later. The fixed blade should be out in the second quarter of this year, with the folder following in the third quarter, according to Cashbaugh.